Page 2 - Taking the "Route de Napoléon"
The route is thus named because of its strategic importance during the Napoleonic wars and it is the route Napoleon took to cross into Spain following the old Roman road the Via Triana. It was also used as a route through the Pyrenees by Emperor Charlemagne. The Route Napoléon is the route that pilgrims have used for several centuries primarily because of its lack of trees and other places where bandits could hide, unlike the heavily wooded route through Valcarlos. This is one of the toughest parts of the whole Camino Frances as for most of the first few kilometres you will be climbing up into the mountains and the first 2 kilometres are particularly hard. To reach the beginning of the Route de Napoleon follow the signs initially for the Chemin St Jacques. Once through the Port d'Espagne you should soon come across a sign, just after a water fountain, for the Route de Napoleon. The route is clearly marked and after approximately 5 kilometres you should reach the village of Huntto (or Untto) where you can find accommodation or you can choose to continue your walk through to the village of Orisson. Along this part of the route you will see some spectacular views, subject to the weather of course, across the Pyrenees mountain range. Be aware that the markers for the route around this area are on rocks on the ground, so may be covered. Orisson is approximately 5 kilometres from Huntto and here you will find a pilgrim hostel or auberge (albergue in Spanish). If you do decide to stay at any of the pilgrim hostels along the way, we would recommend that you call ahead and reserve your place as they can get full very quickly. Some hostels do, however, only take people on a first come first served basis. 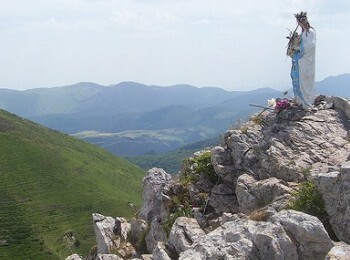 Following the uphill path from Orisson you will come across the statue of the Virgen d'Orisson reportedly brought here all the way from Lourdes by shepherds. You will often find the statue bedecked with flowers placed there by both locals and pilgrims alike. At this point take a right fork and continue straight at the road junction. Not long after leaving the Vierge d'Orisson you will pass what is left of the Chateau Pigñon, a castle that had been built by the Spanish when they conquered this region in the 16th century. Surprisingly it was destroyed by the Spanish during the Napoleonic wars at the end of the 17th and early 18th centuries. At the remains of the chateau take a right hand fork that leads to a farm until you reach the Croix Thibaut on the right hand side of the road. The track from here takes you up to the summit of Leizar-Atheka and in about 3 kilometres reaches the Spanish border at Col d'Arnostéguy. From here the Camino begins to descend down towards Col de Bantarte and through some woods from where you keep going straight towards Col Lepoeder. Col de Lepoeder, at 1410 metres above sea level, is the highest point on the Route de Napoleon. From here you get your first view of the roof of the Abbey of Roncevalles. 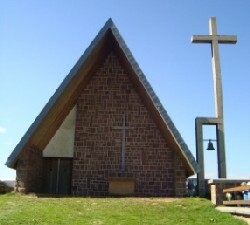 It was rumoured that in medieval times the Col de Lepoeder was where you would find Charlemagne's Cross, said to have been placed on the spot where the Emperor prayed to Santiago, giving thanks to the Apostle for the safe crossing of his army over the Pyrenees and asking for the Saint's help in his battles with the Moorish invaders. Unfortunately, the historical timeline is a little out of kilter as Charlemagne's conquests took place in the 8th century and the Apostle's remains were not found until the 9th century. Despite all this medieval pilgrims would stop here and pray to the Apostle for a safe journey. From here you are again faced with a decision, which route do you take down to the hamlet of Roncevalles? One route takes you through Puerta de Ibañeta and is considered the easier, but slightly longer, of the two routes or alternatively, you can take the Roman route, or Calzada Romana but this is much steeper. Both routes lead you to the Abbey at Roncevalles. For the route through Puerta de Ibañeta follow the markers towards the road and then just follow this road for about 4 kilometres until you get to Puerta de Ibañeta. Here you will find a small monument to Roldán (Roland) one of Charlemagne's favourite knights and commemorating the Battle of Roncevalles which took place in the late 8th century. There is also a small chapel here which has been built over a smaller chapel once occupied by a monk who would ring a bell to guide pilgrims to the chapel during bad weather. The legend behind the monument being in this spot is that it is believed to be the spot where Roldán sounded his horn Oliphant, as well as where he met his end. 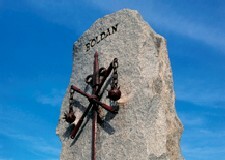 It was during the wars with the Moors that Roldán led 20,000 Christians up to the pass above Roncevalles. He had been told by Emperor Charlemagne that if he got into trouble he should sound his horn and he would come with reinforcements. Unfortunately up in the pass the Christian army is ambushed by a huge Moorish army of in excess of 400,000 warriors. Roldán's best friend Oliver advised him that he should blow the horn but unfortunately Roldán left it too late. Every one of the Christian army was killed and Roldán being the last man standing gave 3 long blasts on his horn, so hard did he blow that horn that the veins in his temples burst causing his death. I would have thought some of the sword wounds would have also contributed to his death, but then that doesn't make such an interesting story. For the alternative route follow the markers to the road crossing into the woods and continue following the markers until you reach Roncevalles in 4 kilometres. This route descends 500 metres and is pretty hard on your legs, so if you have any problems take the route through Puerta de Ibañeta.